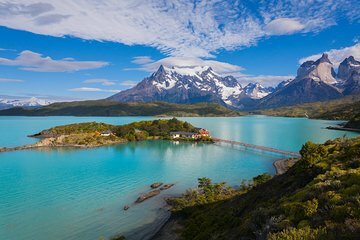 Scopri la Patagonia cilena con questo tour di un giorno da El Calafate al Parco Nazionale Torres del Paine. Attraversa il confine accompagnato da una guida esperta e goditi il magnifico paesaggio del parco, fatto di laghi alpini, aspre vette e ghiacciai sbalorditivi. Ammira lo spettacolare ghiacciaio Grey e l'omonimo lago e fai un'escursione alla cascata Salto Grande. Il viaggio di andata e ritorno dal tuo hotel di El Calafate e il pranzo sono inclusi. Sperimenta un altro lato della Patagonia con questo tour guidato di un giorno intero del Parco Nazionale Torres del Paine in Cile. Ideale se hai poco tempo a disposizione, questo tour ti consentirà di assistere al panorama mozzafiato del parco in un solo giorno. La tua avventura multinazionale inizia con il prelievo di mattina presso il tuo hotel di El Calafate. Scopri la geografia di quest'area lungo la strada panoramica fino al parco, viaggiando in un autobus a quattro ruote attrezzato per attraversare il terreno sterrato della zona. Passa per la splendida laguna Amarga e il lago Sarmiento, e sosta in diversi punti panoramici per una vista spettacolare dei "corni" della Cordigliera del Paine e altre vedute mozzafiato. Dopo circa 3 ore e mezza di viaggio, attraversa la dogana per entrare in Cile con l'assistenza di una guida esperta e prosegui per lo spettacolare Parco Nazionale. Goditi un pranzo al sacco lungo il tragitto che include un sandwich, frutta, insalata e una bevanda. All'interno del parco ammirerai attrazioni come il lago Pehoe, il fiume Paine e il magnifico ghiacciaio Grey che torreggia sull'omonimo lago. Parti per una breve escursione a piedi per ammirare la gorgogliante cascata Salto Grande e le altre attrazioni naturali del parco. Trascorri 3 o 4 ore a esplorare le antiche meraviglie geologiche del parco, poi risali sull'autobus per il viaggio di 4 ore di ritorno a El Calafate, dove verrai riaccompagnato al tuo hotel in tarda serata. We weren't impressed by this tour because of many reasons. - Way too much time on the bus. The short-cut on the unpaved road is a bone jarring, older rollercoaster-like drive. At times during the drive you are thrown off your seat by a few inches. - Most of the stories and explanations are offered in Spanish. English translation is bare minimum and more of an after thought. - No advanced notice to passengers to not bring fruits, cheese, meat etc. because Chilean border won't allow any of that. Overall, it is a lot of work for a couple of hours actually enjoying the hike and gorgeous views. For 600, we could have flown to Chile and had a better adventure. Our driver and guide were fantastic and went out of their way to make sure the trip was comfortable and enjoyable. Torres del Paine is an absolutely stunning park. Im giving this 4 stars because the bus trip was too long for me. The tour operator was 5 star. It was very windy the day we were there. The trail we were supposed to hike was closed for safety reasons. The guide made some phone calls and found another trail for us to hike. 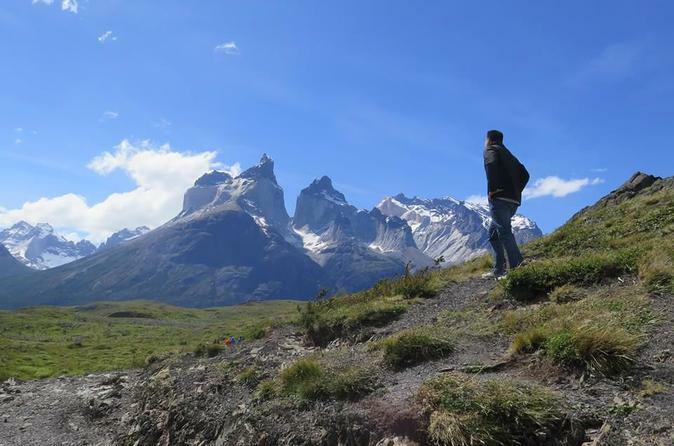 Torres del Paine is breathtakingly beautiful, and more impressive than you can ever imagine until you're there! Overall, an amazing day. However, be forewarned that there are no bathrooms on the bus, and no bathrooms available to tourists for 5 hour increments. The buses also don't have chargers, trash cans, etc. - plus they're not actually buses, but trucks, making for a very bumpy and uncomfortable 4 hour drive each way. and I am glad we took the trip. Our guide was excellent.. It is a nice way to see the Torres del Paine park if you don't have enough time to visit it for a longer period. But the tour itself is not very special. We just had a few stops at the park, and it was a really long day in the car. Absolutely unacceptable lack of communication from both Viator and the local provider when we tried to get confirmation of our pickup time. Moreover, the trip took substantially longer than advertised. We did not get back to el Calafate until after 11 pm. For the day-long trip to Torres del Paine, buyer beware! Our booking through Viator did not provide all essential information for the tour. We had to call Say Hueque Travel to find out information, which yielded nothing. We were also staying st and AirBnb, so pickup from our locations was not accepted. We were picked up at a local hotel down the street, which was the least of our problems. We were advised by some locals to call a local tour company called Always Glaciers to see if we were on their list for the day tour. We were not, but were advised by Always Glaciers to try contacting a company called Patagonia Extrema. Finally, we found out that our tour was booked through Patagonia Extrema. It was horribly overpriced, at 250 USD per person via Viator, in comparison to Always Glaciers your price of 150 USD per person, which we found to be outrageous. Problems did not stop here. We were picked up at our location nearly 20 minutes late, and weee driven to another location to meet up with the larger group. I am not a person who ever has trouble with motion sickness, but the trip to Torres del Paine was so rough, that I got a massive headache and felt like I was going to throw up. The ride only got worse as we entered the park, and our driver drove more crazily around the curved roads. I have never been so queasy. Another problem we ran into was being completely misinformed about the type of currency we could use. Our driver told us we could only pay in Chilean pesos, so we exchanged money thinking that was the only way to pay at the entrance to the park this is approx. 70 USD. We then found out that other people in the bus paid 109 USD and received 30 USD in change. So we paid 100 USD to enter the park, instead of 70 USD. This was infuriating. The views of Torres del Paine we beautiful on this day with clear skies, but I would suggest never booking though Viator, because too much information is hidden from the buyer. I would also discourage anyone from ever using the tour company Patagonia Extrema. They were horribly misinformed, and ended up losing us more money horrible!, not to mention the ride felt far from safe and comfortable. If you make the trip to El Calafate, book another tour. A long day but it was the only way we were going to get to see Torres del Paine on this trip. Lunch was basic yet sufficient, I understand the regulations from crossing the Argentina - Chile border and catering on mass can make this very difficult so it's understandable. The tour guide was friendly, helpful and informative and despite being on the bus for the majority of the day, it felt like they broke up the journey as much as possible. Time in the park was very limited but this was always going to be a whistle stop tour due to the distances involved.